In small bowl, stir together dip ingredients. Cover; refrigerate at least 1 hour to blend flavors. Rinse and thoroughly dry vegetables. Trim broccoli and cauliflower floret stems. 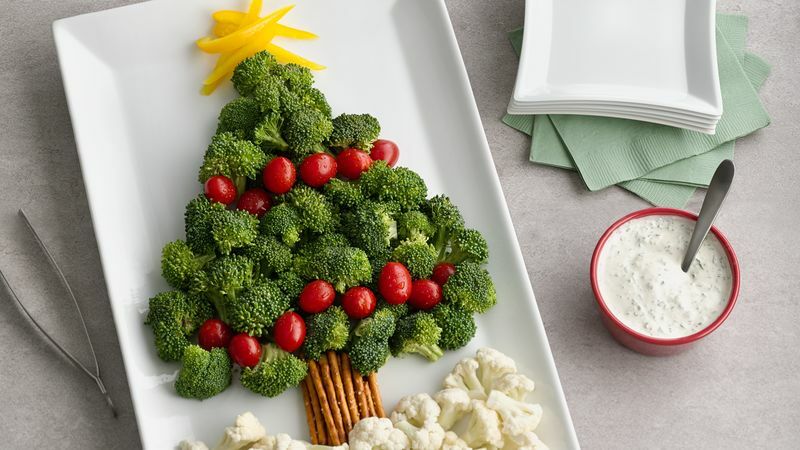 Arrange broccoli on serving platter to form tree shape and tomatoes to form garland. Arrange bell pepper to form star and cauliflower to form snow (see photo). If desired, cover and refrigerate up to 4 hours. Just before serving, arrange pretzels at bottom of tree to form trunk. Serve with dip. Around the holidays, search craft stores for Christmas tree-shaped papier-mâché boxes. Use the lid of the box as a serving tray. Place double-sided tape on the circumference of the lid, and cover tape with a length of festive ribbon. Line inside of box with foil or parchment paper. Arrange vegetables as desired. Use mini star- or heart-shaped cookie cutters to cut shapes from yellow and red bell peppers or thick slices of cheese. Top the tree platter with a star cutout, and trim the vegetable tree with heart-shaped cutouts. Or try using red bell pepper strips as garland.